Recycle your holiday string lights here and help save animals in the wild! Recycling keeps items out of landfills. Less space for landfills means more space for animals! A recycling bin is located at the Zoo’s main entrance. Only string lights will be accepted for recycling; please do not bring other items such as flood lights, extension cords or light hooks. The collection bin will be open through the last day of Zoo Lights on January 14. 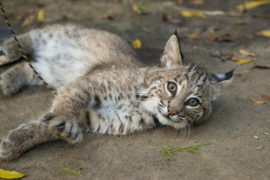 A bobcat, like the ones you are saving by recycling your holiday lights. It may not feel like winter, but the holidays are almost here and with that comes the task of putting up your holiday lights. This task comes with many issues, what if you put them up and they don’t work? What if they have gone out of style? What if they just use too much energy and you want to buy LED lights instead? If you are having any of these issues or other issues and need a place to dispose of your old or broken string lights you can bring them to the Houston Zoo to recycle! Recycling holiday lights keeps them out of landfills. Less space for landfills means more space for animals, animals like bobcats, deer, and the Texas State Small Mammal, the armadillo. 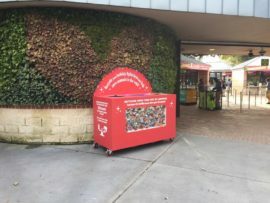 Recycle your holiday string lights in this bin, located at the Houston Zoo’s main entrance. You can bring your holiday string lights to the main entrance of the Houston Zoo until January 14. Simply place them in the bin that says, “Recycle your holiday lights here and help save animals in the wild!” We will make sure they are responsibly recycled and you can enjoy your holidays knowing that you helped save animals in the wild! With your help, the Houston Zoo has recycled more than 7,486 pounds of holiday lights to date. This is nearly the same weight as a female Asian elephant!